I have a scanner, and love it. Sometimes it is hard to know where to start with essential oils and supplements. Some people have a list of wellness concerns that makes things seem overwhelming. Receiving a scan, it simple, only takes a minute, it doesn’t hurt. If you would like to receive a scan, please email me. The scans normally cost $25 out there, and if you are a customer of mine, I will always provide the scan for you free of charge. “Every biological or non-biological thing has a unique energy signature that vibrates at certain frequencies. A frequency is simply the number of times a wave repeats itself within a second, called an oscillation. iTOVi has measured and recorded each unique frequency as it relates to biopoints and the vitamins, minerals and oils of each product company. Through the electrodes on the iTOVi scanner, these frequencies are sent to the body, inducing a measurable response from the body. During the scan iTOVi passes small electrical currents through the skin to measure the body’s resistance. . . . Each supplement has a natural energy frequency, which is easily recognized by the body. The passing of frequencies then induces a measurable response from the body. . . .
As the iTOVi scan runs, your body will naturally react to these foreign frequencies and the scanner will record these changes, identifying them as unresolved biopoints. Biopoints are simply parts of the body, such as organs, vertebrae, or other biological systems. If a recorded frequency falls outside a predetermined range, it is classified as “unresolved.”. . .
1. Emotional: Feeling stressed or uninspired? Products that fall under the emotional category may influence your overall well-being, attitude, or mood. 2. Environmental: Your immediate surroundings can have a significant impact on your emotions and personal wellness. Products in this category may improve your response to your surroundings. 3. Physical: From muscle soreness to distracting headaches, nobody enjoys the feeling of pain, illness, and discomfort. Products in the physical category may have an impact on your physical well-being and general health. The scan will provide you with a report that will break down oils and why. I always like to bring in the emotions book to, because there is thoughts about emotional feelings can create physical ailments. The scan is not for everyone, but it is sure a fun thing to try and see what is there for you. Our bodies are highly complex chemical, structural, and energetic masterpieces with trillions of components and millions of processes and cycles. The elegant symphony that occurs within each of us to keep our body in a state of well-being highlights our complexity and individuality. The body also has many ways of revealing its inner workings beyond that of traditional methods. Continually on the move, our bodies are changing, pivoting, and adjusting to keep us in a state of health and homeostasis. Internal and environmental stressors, both useful and harmful, are some of the leading causes of these changes and generate reactions within the body. iTOVi traces these occurrences in the body by sending stimuli to induce a response. For centuries, reactions from the body have been observed and recorded using a variety of methods, including pulse, eye dilation, breathing patterns, and more. iTOVi uses galvanic skin response/GSR by measuring the electrical conductivity of the skin and identifying the most pronounced changes. Galvanic skin response has been around for a long time, and iTOVi is making advances into the measurements GSR provides. After an iTOVi hand scan is complete, the data is processed through iTOVi’s complex proprietary algorithm, giving us a deeper look at the small changes in the conductivity of the skin. We then analyze the scan results to increase the intelligence of the iTOVi algorithm. Once the iTOVi scan is complete, a report will show you the results of your scan in the iTOVi app. The scan results are listed in priority based on the changes in the electrical conductivity of the skin. The report is permanently saved under the client name in the app. You can also choose to email or text the report to the client through the iTOVi app, giving you a convenient way to share the scan results. The iTOVi nutrition scanner is an advanced and powerful tool to help you grow your business and learn more about your overall wellness. 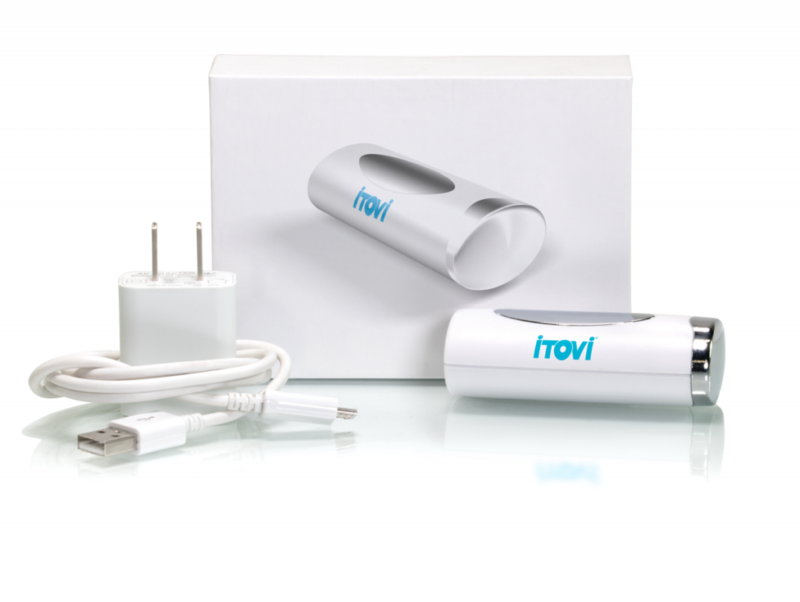 The iTOVi scanner and app system have not been evaluated by the U.S. Food and Drug Administration (FDA), and therefore the iTOVi system does not treat or diagnose any disease or condition. Individual iTOVi scan results are not an indication of health and are not intended to diagnose, treat, cure, or prevent any disease.